Today we feature SoleMate Shira who ran in the 2014 NYC Half Marathon for Girls on the Run NYC on Sunday, March 16! Shira was our #1 fundraiser for the NYC Half and a true Girls on the Run SuperStar! Why did you choose to support Girls On The Run NYC through your training for the NYC half marathon? I chose to run in the NYC Half Marathon for Girls on the Run NYC because running makes me feel confident and strong. I always feel like I accomplish something special after I run and I want to help other girls feel that way too. What is your favorite part of the half marathon training? My favorite part of the training is to gradually increase my distance to be able to run the 13.1 miles easily. It is a great personal challenge! I have always let friends and family know how important running is to me and they have seen how happy it makes me. When I told them about Girls on the Run and what they do for girls, they were happy to support me. Also, I go to an amazing school and the teachers and students were all really supportive. What activities have you done to fundraise for Girls On The Run? I sent an email to everyone I knew and explained to them what running and Girls on the Run means to me. I also had a bake sale at my school. Being a part of Girls on the Run means that I can help other girls feel good about themselves through running. It is satisfying to know that I can help them in this way. Check out Shira’s fundraising campaign here. Are you interested in becoming a SoleMate? Go to gotrnyc.org/solemates-program for more information! 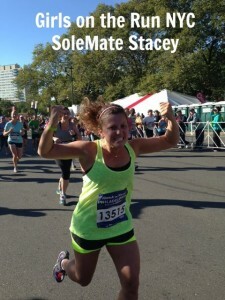 Today we feature SoleMate Tanya Tran who ran in the 2013 NYC Marathon for Girls on the Run NYC! When I signed up for the NYC marathon, I knew supporting a cause I believed in through my training would give the whole experience more meaning. After looking through hundreds of potential organizations available to support, Girls on the Run stood out the most to me. I really love its mission of instilling a sense of self-efficacy and self-confidence in young girls, and know firsthand just how powerful that can be when struggling through those difficult teenage years. I love the idea of using running and an interactive life-skills curriculum to help girls learn to nurture themselves both physically and emotionally. During years when you’re being told who you should be and how you should act by others around you, having a strong sense of self and remembering to take care of yourself is so important. I’ve (surprisingly!) really loved the long training runs. I have a bike path by my house that runs by the water, and each week I would look forward to long, peaceful runs on that path. They would give me a chance to get away from the hectic pace of life and just be alone with my thoughts. They would allow me to let my mind wander and really appreciate the beauty around me. Each time, I would try to notice new things I had never seen. I felt truly lucky to be out there, running with my own two legs and really taking in my surroundings. And at the end of each run, it always felt great to know I had accomplished yet another workout I didn’t think I could do! In reaching out to people, I tried to emphasize how much of a difference each person could make, regardless of the size of their donation. A lot of my friends are graduate students or are just starting out. I knew that while they wanted to help, they couldn’t always afford to give as much as they might want, so I tried let express to them how important a contribution of any amount was. I also followed up with thank you notes to all that contributed and shared with them how meaningful it was to have their support, not only to me but to all those involved in Girls on the Run. I’m lucky to have very supportive friends and family! I primarily reached out to people through email to let them know that I was supporting Girls on the Run. I tried my best to convey how much I believe in the organization and their mission, and how their support can really make a lasting impact for young women. I also tried spread the word about Girls on the Run to people I spoke with in-person. Whenever someone asked me how my training was going, I would share with them how excited I was to also be able to support such a meaningful program. Running has meant so much to me; it truly has been a gift. While at times, it’s been painful and frustrating, it’s also given me support and strength. It has given me the belief and knowledge that I can truly do anything I put my mind to, and that even during the moments when I don’t think I can get through a tough workout, a stressful day, a challenging week… that I can make it through despite any doubts or second-guessing I might experience. Running has given me the courage and ability to always believe in myself. Being part of Girls on the Run NYC SoleMates means to me that I am able to give back and help others girls discover this same feeling of accomplishment and self-confidence. It means getting to share the gift of running.